Sunflower Cottage is a two bedroom fisherman's cottage dating from the 17th century in the village of Mousehole in Cornwall. Mousehole is a picturesque fishing village with winding streets and a pretty, sandy harbour, which is just a stone's throw from the cottage. Shops, inns and restaurants are only 100 yards away and the bustling towns of Newlyn and Penzance, with day trips to the Isles of Scilly by helicopter or by sea, are 3 miles. Reached by causeway or ferry, St Michael's Mount (N.T.) stands majestically over Mount's Bay nearby. Minack open-air theatre and Land's End are about 10 miles. Sea fishing, sailing and horse riding locally. 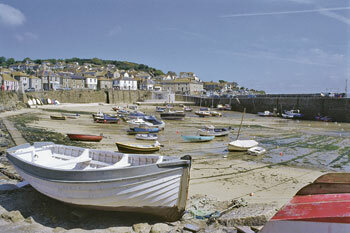 One hundred years ago the village of Mousehole was a busy fishing port, full of local fishing boats. The main local catch was pilchards. The village retains much of its charm from this era, with its narrow streets, which today is full of shops, galleries and restaurants. 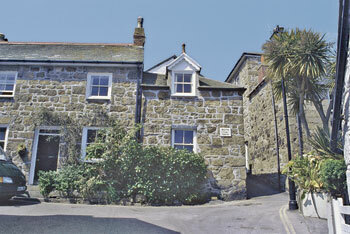 The properties around the inner harbour are built from finely grained Lamorna granite. Dylan Thomas described the village as the loveliest in England. Two bedrooms. Comfortable sitting room with open fire and electric fire. Beamed dining room. Small pine kitchen. Steep stairs to first floor: Double bedroom with sea views over the roof tops. Double bedroom with wash basin. Bathroom/W.C. (shower over bath).